Best known for the lead role in Superman, Christopher Reeve has dedicated his life to those with disabilities ever since he suffered an injury that left him paralyzed from the neck down. Christopher Reeve was born September 25, 1952, the oldest of two sons born to Franklin D. Reeve, a novelist, translator, and university professor, and Barbara Pitney Lamb Johnson, a journalist. Reeve's parents were divorced when he was about four years old, and he moved with his mother and brother to Princeton, New Jersey. Although he enjoyed a privileged childhood following his mother's remarriage to a stockbroker, he nevertheless had to cope with the anger and tension that characterized his parents' relationship. Reeve would often pass the time during his youth playing the piano, swimming, sailing, or engaging in some other similar activity. While he was still just a child around ten or so the stage began to call. His very first role was in a Princeton theater company's production of Gilbert and Sullivan's The Yeoman of the Guard, and after that experience, Reeve was hooked. Later, as a gawky teenager lacking in self-confidence, he found that acting helped him overcome his feelings of clumsiness and insecurity. Reeve starred in virtually every stage production at his exclusive private high school and also spent the summer months immersed in the theater, either as a student or an actor. By the time he was sixteen, he was a true professional with an Actors' Equity Association membership card and an agent. After graduating from high school in 1970, Reeve attended Cornell University, where he earned a bachelor's degree in English and music theory in 1974. Meanwhile, he continued his drama education, serving as a backstage observer at both the Old Vic in London, England, and the Comedie-Francaise in Paris, France, before enrolling in the Juilliard School for Drama in New York City to pursue graduate studies. Reeve's first major acting assignment came shortly after his graduation from Cornell when he joined the cast of the television soap opera Love of Life. He remained with the program for two years, during which time he also performed on stage in the evenings with various New York City theater companies, including the Manhattan Theater Club and the Circle Repertory Company. In 1975 Reeve headed to California and won his first movie role, a bit part in a 1978 nuclear submarine disaster movie titled Gray Lady Down. But when no other work was forthcoming, he returned to New York City and appeared in an off-Broadway play that opened in January 1977. Then, to Reeve's surprise, Hollywood came calling with an offer to try out for the role of Superman in an upcoming film of the same title. At first, Reeve thought the idea was downright silly and very untheatrical, but when he read the script, he loved it. When Superman premiered in December 1978, it met with almost universal critical praise and box-office success. Suddenly, Reeve was a megastar with all of the baggage that entailed, including countless demands on his time, a total loss of privacy, and the danger of being offered only similar roles to the "Man of Steel." Superman II, which Reeve had agreed to do when he signed on for the first film, was spectacularly successful upon its debut in mid-1981. The critics also liked it, with some even saying that it was better than the first movie. Throughout the 1980s and early 1990s, Reeve enjoyed an increasingly busy film career. Besides reprising his most famous role in Superman III (1983) and Superman IV: The Quest for Peace (1987), which he also helped write, Reeve appeared in about a dozen other pictures, including Deathtrap (1982), Noises Off (1992), The Remains of the Day (1993), and Village of the Damned (1995). On May 27, 1995, Reeve's world was shattered in a matter of seconds when he was thrown from his horse head first during an equestrian competition in Virginia. The impact smashed the two upper vertebrae in his spine, leaving him completely paralyzed from the neck down and able to breathe only with assistance from a ventilator. Reeve remained in intensive care for five weeks as he fought off sickness, underwent surgery to fuse the broken vertebrae in his neck, and weathered several other life-threatening complications of his injury. With Reeve's characteristic grit and determination, he set about the task of putting his life in order. He mastered the art of talking between breaths of his ventilator. He learned how to use his specialized wheel-chair, which he commands by blowing puffs of air into a straw-like control device. Always hungry for the smallest sign of progress, he did countless exercises, competing against himself to improve and grow stronger. Reeve astounded his friends and admirers by making his first public appearance on October 16, 1995, less than six months after his accident. The occasion was an awards dinner held by the Creative Coalition, an actors' advocacy organization he had helped establish. Reeve joked with the audience about what had happened to him and immediately put everyone at ease, then introduced his old friend Robin Williams (1952–), who was being honored for the work he had done on behalf of the group. The awards dinner was just the beginning for Reeve, who has since channeled his considerable energies into a wide variety of endeavors. Before his accident, Reeve was an activist on behalf of children's issues, human rights, the environment, and the National Endowment for the Arts (NEA). He has since assumed the role of national spokesman for the disabled, especially those people who, like him, have suffered spinal-cord injuries. He is also the founder of the Christopher Reeve Paralysis Foundation, which raises funds for biomedical research and acts as a champion for the disabled, and serves as chairman of the American Paralysis Association. Meanwhile, Reeve continues to cope with the daily trials and occasional triumphs related to his quadriplegia, or being paralyzed from the neck down. "You don't want the condition to define you," he once commented, "and yet it occupies your every thought." While he may never be completely free of his respirator (a device to help one breath), he does manage to go without it for several hours at a time. He can move his head and shrug his shoulders, and he reports some movement and sensation in his hands and feet. Reeve is determined to walk again; one of his fondest dreams has been to stand up on his fiftieth birthday in 2002 and offer a toast to all of the people who helped him get to that point. "When John Kennedy promised that by the end of the 1960s we would put a man on the moon," Reeve told Time magazine, "everybody, including the scientists, shook their heads in dismay. But we did it. We can cure spinal-cord injuries too, if there's the will. What was possible in outer space is possible in inner space." 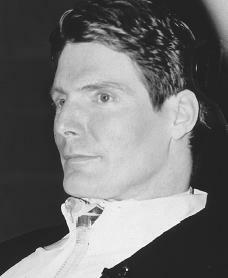 Christopher Reeve, husband to Dana Morisini since 1992, is the father of three children. He continues to be an inspiration to many, frequently traveling across the world to speak and to support various groups and organizations. Havill, Adrian. Man of Steel: The Career and Courage of Christopher Reeve. New York: Signet, 1996. Nickson, Chris. Superhero: A Biography of Christopher Reeve. New York: St. Martin's/Thomas Dunne, 1998. I really liked this artical cause it says alot about his life.I am doing a research paper on him. Also i really loved the Superman movies. But its sad that he had to pass away. Superman will go on forever!!!!!!!!!!!! !